It has been close to 3 years since Drupal 8 was released. With lots of amazing new features released in every 6 months we are getting more and more excited to see how Drupal has evolved and improved. With the release of Drupal 8.4, it is starting to use ES6 in core. However, there is not yet a standard practice to write ES6 in custom modules and themes. In this blog we will share our story on how to configure the project with webpack and other tools to facilitate ES6 in the whole Drupal 8 project including both custom modules and at the theme level. We are assuming you have sound knowledge of Drupal, Linux, Bash and PHP tools like Composer. In this article we will setup a Drupal example website in our local machine with Drupal 8.6.0, Drush 9.4.0. Assuming your local site is up and running. You could also check the tip “Install on your machine” in the end of the post. Half of the dev dependencies are copied and used in the Drupal core. With the similar settings we could leverage the eslint config files shipped in the Drupal core. // ES6 JS in the custom Drupal modules. // ES6 JS in the custom theme. * Gets the file path of the compiled JS in the Drupal module. 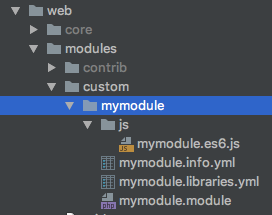 * The compiled module JS files stay in the same directory of source js files. // Remove .es6.js file extension. * Get the file path of the compiled JS in the Drupal theme. 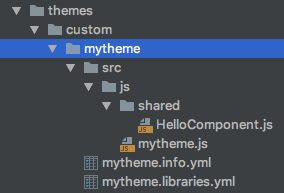 * The compiled theme JS files stay in the assets/js directory. Beyond, you can configure the settings to fit your project unique requirements like including the more global libraries. For example we could include a global library called CookieMonster. Once this is set we could use CookieMonster directly without using ‘import CookieMonster from CookieMonster“ in our ES6 scripts. Now we are free to use ES6 in both Drupal custom modules and themes by following a couple of conventions. In the webpack.config.js, we have setup the source and output directory of our ES6 scripts. However they are slightly different in the modules and themes. The theme JS convention is slightly different from that JS in the modules because we get more flexibility to write JS in the theme. Instead of using the .es6.js extension, we could use different directories for source and output JS files. In this example, the source directory is configured as mytheme/src/js and the output directory is mytheme/assets/js. This means we could use same file name for both source and output versions. The rationale behind this is that it is more likely to write more complex JS in the theme and we could spit code to separate JS files for better architecture. In the example below we will create a JS in mytheme/src/js/mytheme.js and compiled file will be found in the mytheme/assets/js/mytheme.js. Alright, it’s demo time. In the following section I will create a custom module and a custom theme in Drupal to demonstrate how to use ES6 script in Drupal. When we enable this module and set the example theme as default, we could see both JS in the module and theme output a hello message in the browser console. In this example we create a path alias in webpack called ‘_shared’, this makes it easy to import JS in both theme and module scripts. We could take advantage of import feature in ES6 to build small blocks. Define an example library which will load a compiled mymodule.js file. In this JS file, we import a custom component by using path alias defined in the Webpack and log hello message in the browser. * Load example js in every page. We load module JS on every page. After the build task is completed, you should see the compiled JS file in green colour in the terminal. Open the Drupal website in Chrome with developer console opened, refresh the page Voila, now you see those files are loaded in the browser and working now. In this article, we have setup ESLint, Webpack, babel to support and compile ES6 scripts in both custom module and theme, so ES6 JS source can be compiled to old browser compatible version. Later we create a custom module and theme and show you the examples of how to add ES6 scripts to those places. Once both module and theme have been enabled and used as default, we should see the hello message in the Chrome browser console. If you also use git in the project, you need add some git ignore rules. As the compiled JS could be built in the CI, we could git ignore them as well as node_modules. Nice, interesting post! I am looking for something like this. Great idea to make the custom modules part of the build! Is there a github repo where I can check the full code?